Sure spiders are creepy, but it seems like as far as Halloween is concerned, they dropped into the wrong crowd. 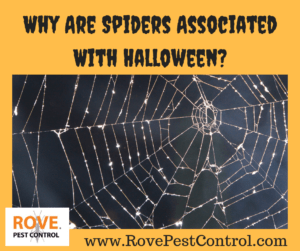 In this post, we cover some of the reasons why spiders are associated with Halloween. During medieval times, witches were all the rage. Well, at least most people thought they were real and terrorizing society. Halloween was the worst of it, and many believed that witches were at the height of their power during that time of year. Witches needed a few side kicks though to do their dirty work. This wrapped spiders up in the witches’ webs of evil. Other pests beyond spiders linked up to witches, such as rats and bats. There are several superstitions related to spiders and Halloween. One is that if a spider falls into a lit candle or lantern that witches are near by. The origins of Halloween are traced back to pagan rituals and traditions including odd legends and folklore. One such story claims that if you see a spider in your home during Halloween it is actually the spirit of a loved one watching over you. Spiders have also been thought to have mystical powers because they can spin webs. In ancient times, this ability caused them to be associated with magic, and again witchcraft. So again, it’s fitting that they would be associated with Halloween. Halloween was originally established around the Celtic holiday of Samhain which was a pagan holiday establishing the change of the seasons: the transition from the end of summer into fall and winter. The colors of Halloween are typically orange and black which represent the typical fall colors with orange, and death with black. Death was associated with the death of summer, but the holiday Samhain was also thought to be the thinnest barrier between the living world and the spirit world, making black a fitting color. With the majority of spiders being black and also being all around creepy, it’s no wonder they got lumped into this spooky holiday. With many movies like, Arachnophobia putting spiders as the main antagonist, it’s no wonder we don’t like arachnids. You’ll often find spiders hanging out in dungeons, and all around scary places in movies and on TV. We naturally associate spiders with death, venom and abandoned places. Because of this, it’s natural to tie them in with Halloween. The transition from fall to winter is one of the major times throughout the year where pest activity spikes. When temperatures drop and seasons change most pests will seek out new places to call home. Typically this is your house. Your home usually has optimal temperatures as well as food, water, and places for shelter. This causes a variety of pests to sneak into your home along with the spiders. Spiders are predators and feed on other insects and pests, so they will be naturally drawn to your home in pursuit of other pests. With Halloween being the holiday that originally marked the transition of the end of summer, it’s no wonder spiders got lumped in as a mascot. It’s probably the peak time of year you’ll see them around your home, so associating them with this particular holiday made sense. While fake spiderwebs as decorations may be fun for a few days, you might not want to let the real ones stay up too long. Seeing lots of spiders could also be a warning sign that there is increased pest activity going on in your home you may not know about. For spiders to be around, they have to be eating something. Usually it’s other pests and insects hiding out in your home to escape the colder temperatures. So if you’d like to get rid of the spiders in your home after it’s time to take down the decorations this year, reach out to us at Rove Pest Control. Did you get value from this post on, Why spiders are associated with Halloween?, please retweet below.